I am a 34 year old mother of one, who by all accounts had a very normal life and had no known health issues. 2016 opened our eyes to one of the most significant causes of death in Australia, Sudden Cardiac Arrest. What was worse for me was idiopathic SCA- no known cause. This is my story of this year of hell, despair and terror but also the realisation of the love of family, friends, colleagues, medical professionals and people who had never crossed paths with me before. I write this as therapy for me but also to share what is the reality for approximately 33,000 Aussies a year. I was just one of the 5% of the 33,000 who survived. When Brighton resident Anne Holland’s husband Paul died of cardiac arrest in 2008, Anne and their five children were devastated – especially since his death could have been prevented with the use of an automated external defibrillator. It was then that Anne looked around and realised how frighteningly scarce defibrillators are in the community, despite 33,000 Australians dying of cardiac arrest each year. According to the Australian Bureau of Statistics, that’s more than the number of deaths caused by road accidents, fires, breast cancer, bowel cancer, prostate cancer and skin cancer combined. Turning her pain into action, Anne, an experienced nurse, became an author, speaker, first-aid trainer and then founded non-profit Urban Lifesavers last year. 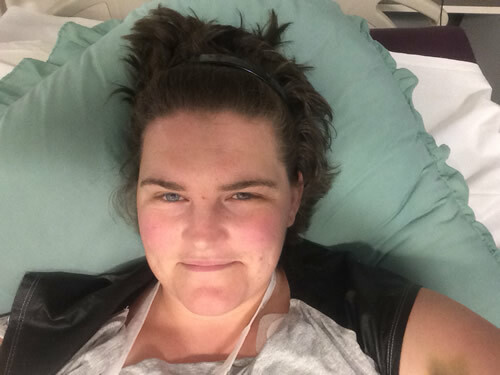 “I’m doing this firstly in memory of my husband, and secondly as a critical-care nurse,” she says. 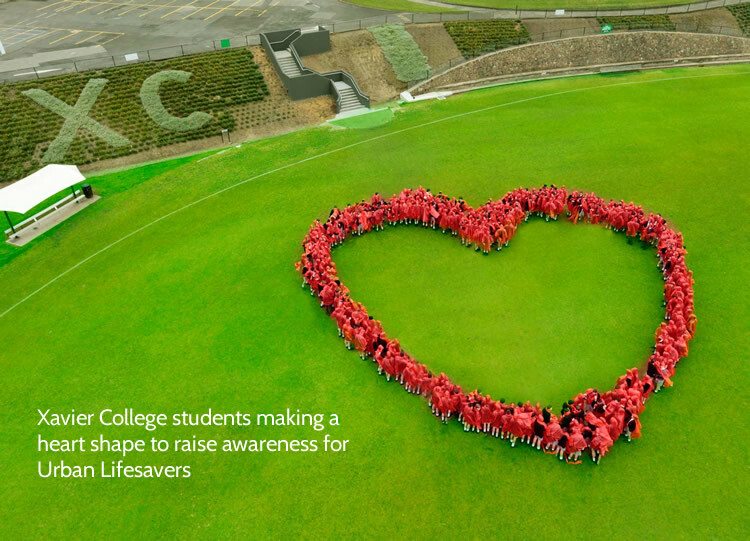 Urban Lifesavers has two main goals: firstly, Anne wants to educate the community about defibrillators. She wants us to know, for example, that a cardiac arrest victim’s chances of survival go from less than five per cent to about 80 per cent if a defibrillator is used within the first five minutes, and that they can’t be used incorrectly because the machine will only administer a shock if a fatal heart rhythm is detected. Secondly, she wants to see defibrillators included in first-aid kits in businesses and public places. It’s now compulsory to conduct defibrillator training as part of first-aid courses but this is pointless if the public doesn’t have access to the machines. “We want them to be as common as fire extinguishers,” says Anne. Anne has poured $40,000 of her own money into the campaign, dramatically impacting her own financial situation and quality of life. 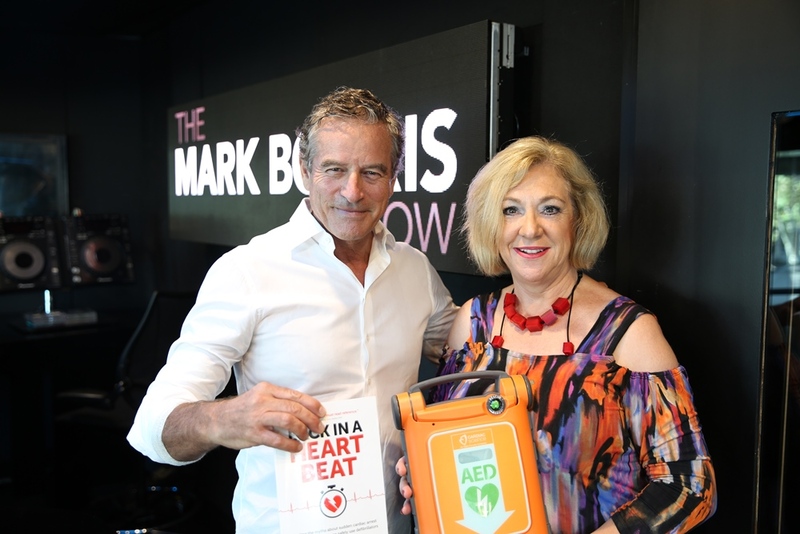 Mark Bouris recently interviewed Anne Holland on his show and discussed Anne's book - "Back in a Heartbeat". Melbourne nurse Anne Holland and her five children were left devastated when her husband Paul died at the age of 56 of a sudden cardiac arrest at their home. “He was fit and healthy and had just returned from his regular two hour Sunday bike ride,” Holland said. Paul had gone upstairs after his bike ride and that’s where he tragically died -- it was 45 minutes before the family discovered him. 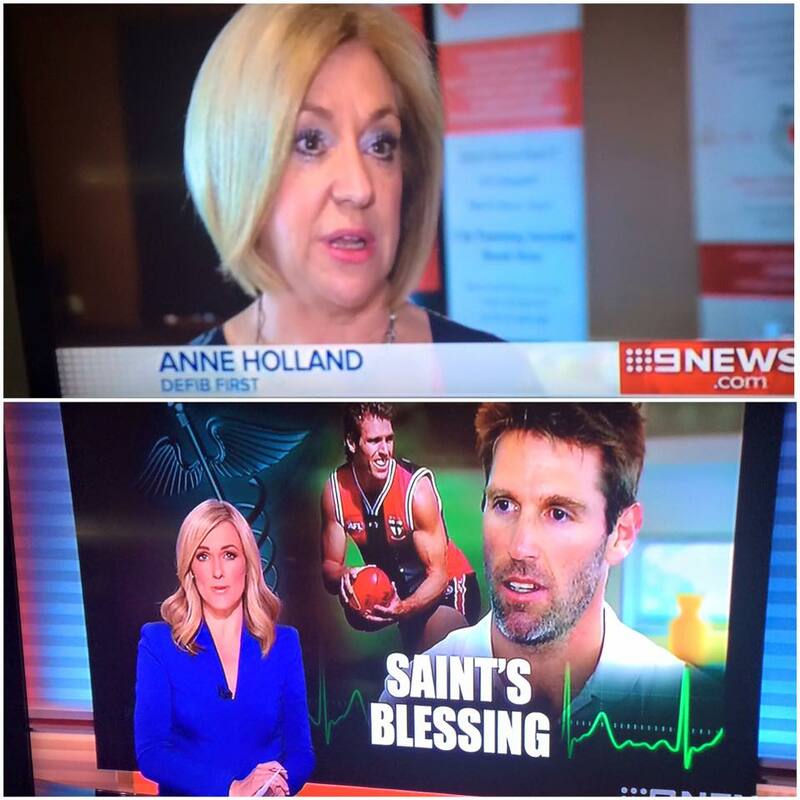 In the years following her beloved husband's death, Holland has devoted her life to educating people about the importance of Automated External Defibrillators (AED) and campaigning to ensure every school and office has one. View the full article on the Huffington Post website or download a pdf of the article here. 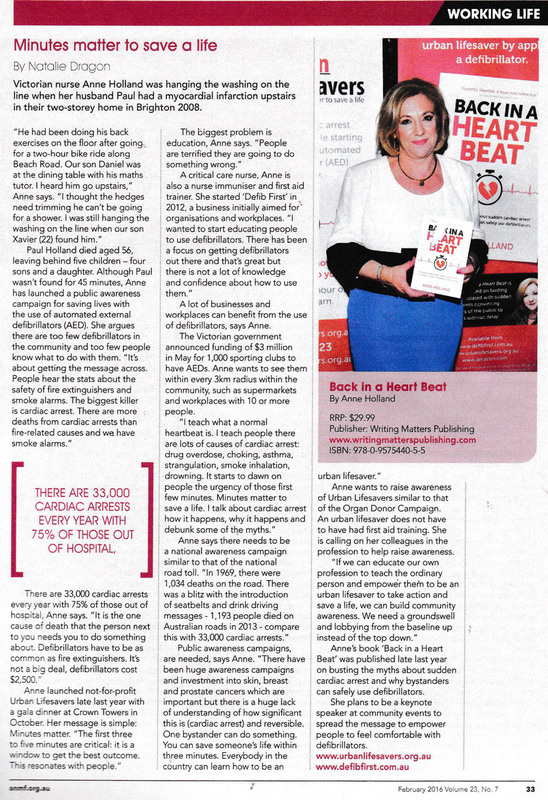 Another great article on AAP September 25, 2015 highlighting the importance of public access defibrillators and saving the lives of victims of cardiac arrest. 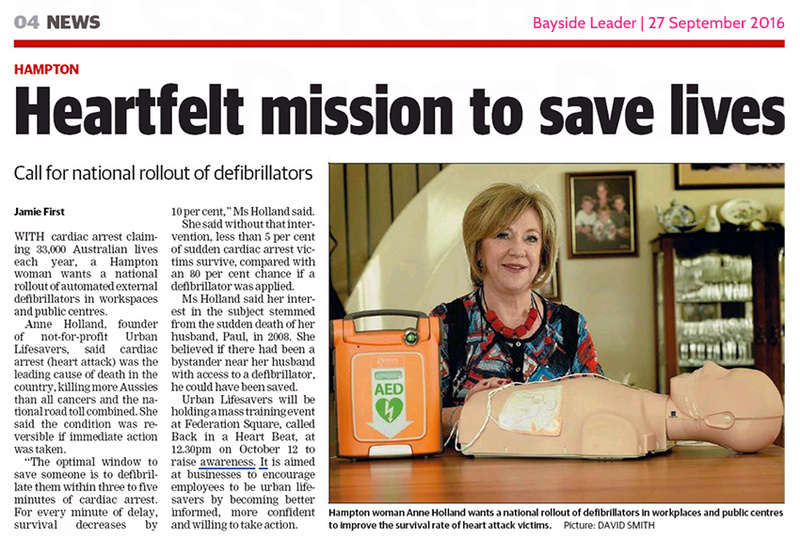 Another great article featuring Defib First by Jon Andrews in Melbourne's Bayside Leader to promote the importance of bystanders saving lives by applying a defibrillator during a cardiac arrest. Anne Holland achieved a first time ever perfect score at the 2014 Key Person of Influence PitchFest competition. PREM Sebastian remembers walking towards the net during his weekly competition tennis match before collapsing and waking up in the hospital with a stent in his heart. The 41-year-old has since been told that, following his cardiac arrest at Essendon Tennis Club on February 7 2013, early defibrillation and CPR saved his life. On Wednesday December 4, 2013, 21 year old Damien suffered a sudden cardiac arrest at home. His 15 yr old brother happened to be home from school due to a headache. He phoned 000 and the operator guided him to perform CPR over the phone until paramedics arrived with a defibrillator & revived the young man. A HUMAN chain of life support across a Cheltenham industrial park, linked by three emergency service units and a hospital ward, has saved new mum Samantha Jobe. She was about to start warming up for her workout at Crossfit121, with husband Damien and eight-week-old daughter Makayla looking on, when she collapsed. A St Arnaud woman who collapsed on a basketball court is alive thanks to the teamwork of bystanders and paramedics. Jenny Gifford, 51, collapsed and went into cardiac arrest about 7.30pm on 14 October. The only sign of Jarrod Brown's brush with death is a dark blue bruise on his chest, just over his heart. Following a young woman suffering cardiac arrest on Chapel St Monday evening, but luckily surviving, paramedics remind the public that all ages are at risk. Paramedics have praised the efforts of a group of quick-thinking shoppers who revived a young woman who went into cardiac arrest on one of Melbourne's busiest shopping strips last night. ST JOHN Ambulance Victoria has called on Victorian football clubs to act now to save lives, following a recent spate of cardiac arrests at local matches. Sports Medicine Australia has also called for the mandatory placement of defibrillators in all sporting clubs in the wake of the tragic death of Bacchus Marsh football player Nathan Prince two weeks ago. St John Ambulance Victoria deputy CEO, Theron Vassiliou, said St John would again be supporting clubs as the summer sports season rolls around, acting as an interim solution while clubs raise funds for life-saving defibrillators, which can cost $3000-$4000. In July 2010, the Geelong football team doctor, Geoff Allen, aged 49, suffered a cardiac arrest on the field during an AFL game at AAMI stadium in Adelaide. He was defibrillated on the ground within 3 minutes and survived, waving to the crowd as he was carried from the field.